. 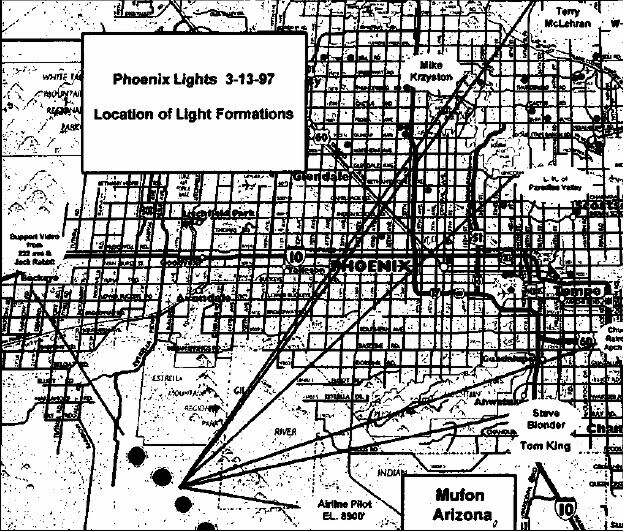 . . At about 8:30 p.m. Thursday, the 13th of March, Peter Davenport at the UFO Reporting Center in Seattle, WA, started receiving calls, first from the northwest part of Arizona, of a formation of lights moving south toward Prescott, AZ. These lights formed a basic triangle with as many as six or seven lights per side with two red lights trailing. I don't know how many times I looked at those tapes and couldn't find the common thread. 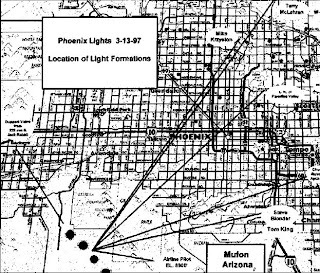 I received a call from a family far to the west of Phoenix where they, too, had taped the lights the night of the 13th and many other times. I made the long drive out to 222nd Avenue and Jackrabbit Blvd to view the tape. The tape did not impress me but the people did. They said that the lights appear between 8:00 and 10:00 pm were always in the same place and would drift laterally. They also said that a lot of helicopter and fighter aircraft traffic was observed at times when these lights appeared. The highest activity was in the mid-part of the month and the most common days were Monday through Thursday. The other key item was that a large area of Bureau of Land Management land had been cordoned off in the direction of the lights. The woman's future son-in-law could see the land below the lights being illuminated like daylight. This was one of the keys, but I couldn't see how it would fit into the puzzle at that time. . . .